A Russian cruise ship stuck in ice off Antarctica with more than 100 mainly UK tourists on board has started to move. The icebreaker Captain Khlebnikov became trapped in frozen waters in a bay near Snow Hill island on Friday. Tour leader Paul Goldstein said they expected to be back in the open sea in the next couple of days. On board are 105 tourists who paid up to £10,000 each for the tour on which they will see rare Emperor penguins off the Antarctic coast. A BBC crew filming for the nature documentary Frozen Planet are among those on the icebreaker. The ship was trapped by large ice sheets and unusually harsh weather conditions but was not in any peril. The delay is expected to put it four days behind schedule. Mr Goldstein, of holiday firm Exodus, said those on board were coping well and the ship was now moving again. He told BBC News: "We're currently mobile, we're breaking through some ice, and due to some frankly unprecedented winds and visibility problems and snow, we're a little delayed. "These situations do happen when you do this style of holiday. There are not stringent day-to-day itineraries. That's not how we work, and that's what people buy in to." Mr Goldstein stressed the vessel was not a typical cruise ship of "two sittings of dinner, bingo and clay-pigeon shooting". Tourist fly to Ushuaia on the southern tip of Argentina to board the ship which takes four days to reach the penguin breeding grounds of Snow Hill. They travel to one of the few places where the penguins can be seen in the wild. 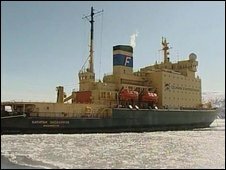 The icebreaker was converted to carry passengers 10 years ago and operates holiday trips to both polar ice caps. A Russian transport ministry spokesman said: "The wind has currently slowed down in the area and the massing of the ice has ended. "Everything is calm aboard the icebreaker. Nothing is threatening the passengers and crew." The spokesman said the ship would head into clear water and back to Ushuaia.